Donald J. Steinberg M.B.A., D.D.S., M.S.D. The blending of art, science, and compassionate care for people led Dr. Donald J. Steinberg to pursue a career in the field of dentistry. A Dallas native, Dr. Steinberg loves living, serving, and working with his fellow Texans in the DFW Metro area. He graduated from Southern Methodist University, University of Dallas, and the Baylor College of Dentistry in Dallas, TX. While at the Baylor College of Dentistry, Dr. Steinberg received the prestigious Merritt Parks award for Outstanding Senior in Periodontics. In 1988, he received the Dallas County Dental Society’s Founder’s Cup Trophy for his work on the regeneration of lost bone and tissue. These bone regeneration techniques have become a standard in the field of periodontal and implant dentistry. In 1995, he became board certified by the American Board of Periodontology, and Dr. Steinberg is currently President of Periodontal & Implant Associates, PA. With decades of dental and periodontal experience, Dr. Steinberg has honed and refined his skills in periodontics and implant dentistry. As a leader in his field, he has vast experience with complex cases needing specialty care whether implant, bone regeneration, gum disease, or cosmetics. The National Consumer Advisory Board named him 2015 "Best Dentist for Periodontics & Implant Surgery," and was additionally named "Best Periodontist" by Texas Monthly Magazine. 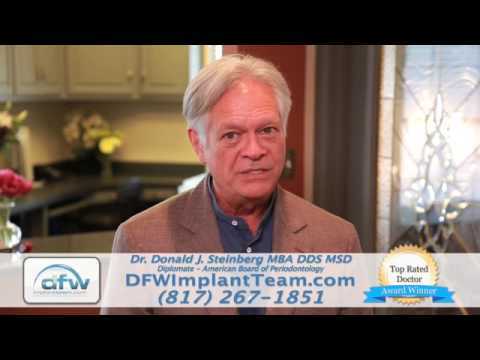 Dr. Steinberg is very respected by peers in the dental field and is known for his compassionate chair side manner in his practice at DFW Implant Team. Dr. Steinberg’s continual love of learning and teaching has led to sponsoring and lecturing continuing education seminars on dental implants, bone regeneration, cosmetic consideration, and more. In 1999, he became the Director of the local branch of the prestigious Seattle Study Club organization with 40 respected dental practices in membership. Dr. Steinberg and his experienced team are dedicated to listening and understanding each patient’s needs and concerns. With his vast experience in complex cases, Dr. Steinberg provides a variety of treatments and surgical procedures for dental implants, bone and tissue grafting, extractions, restorative dentistry, nonsurgical gum treatments and more, for his valued patients. 2105: "Best Dentist U.S.A.," National Consumer Advisory Board (Peer Review). 2014: "Top Southlake Area Dentist," Southlake Style Magazine (Peer Review). 2006: "Best Periodontist," Texas Monthly (Peer Review). 1996: Featured Periodontist, Exclusively Dallas Magazine. 1996 – Present: Sponsor Approval, American Academy of General Dentistry. 1989: Second Place for Bone Regeneration, Fort Worth Dental Society. 1988: First Place (Founder's Cup Trophy) for Bone Regeneration, Fort Worth Dental Society. 1979: Merritt Parks Award for Outstanding Senior Student in Periodontics, Baylor College of Dentistry.